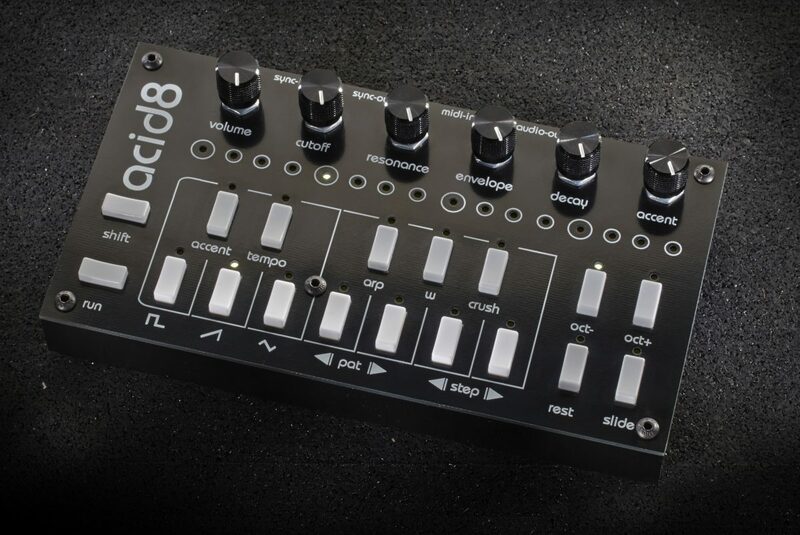 acid8 is an 8Bit bass-line synthesizer with a revisited sound and interface. MKIII has been rethought from the ground up. The filter has been replaced with an new all digital one, the handling has been redesigned for more immediate handling and many other real time features have been added including transposition automation, filter wobbler, stutter and vinyl spin-down effects. The synth engine now has dual oscillators allowing fat and harmonized sounds. acid8 MKIII offers the same features as its slimsynth uAcid8 counterpart, but with the addition of hardware MIDI and analog sync in and out connectivity and packed in a rugged metal case. A vst plugin is available to easily take control of the synth’s parameters. Q:How do I copy/paste a pattern? Q:The briefly LEDS go out when I stop the sequencer – is something wrong? A:This is normal and occurs when the memory is updated (a few seconds after the sequencer is stopped when a change has been made).